On Wednesday night, two Western Conference heavyweights came to the United Center for a game that would be televised across the US and Canada. After being eliminated from consecutive postseasons by the Blackhawks, the Vancouver Canucks certainly have a score to settle any time they play Chicago. This game was unique, though. Roberto Luongo was pulled after allowing six goals on 18 shots to a struggling Minnesota Wild team on Tuesday, and the Canucks were without a number of key players. It would be up to Luongo to slow down a potent Chicago offense that featured two of the top scorers in the league. To his credit, Luongo answered the bell on Wednesday night. He handled a number of breakaways, a few of which were exceptional chances for Marian Hossa, and held the Blackhawks to only one goal on 32 shots in 65 minutes. Considering the circumstances, the performance for Luongo was very impressive. That’s been the story for Blackhawks opponents for a week now, as the netminder in the Indian head sweater has been playing at an elite level. Marty Turco has been the difference in the last four games for Chicago as the Hawks have made a run back to the top of the standings. Wednesday night’s games was just the most recent example of Turco’s recent dominance. He allowed only one goal in 65 minutes while facing 37 shots, 18 of which came in the third period and overtime. He once again made the biggest saves when they were needed, including an effective pokecheck on Mikael Samuelsson’s shootout attempt that sealed the victory. When the Blackhawks made the decision over the summer to walk away from the goalie that won them the Stanley Cup, a lot of fans were angry. After all, Antti Niemi had done for Chicago what Tony Esposito, Ed Belfour and a host of other goalies had not for 49 years. Certainly bringing in the older Turco would lead to a drop-off in play. The crutch argument that analysts (including myself) made to defend the move was that Turco’s save percentage was actually better than Niemi’s last year, but he was facing too many shots behind a very average defense in Dallas. If he was able to play behind a team that allowed the fewest shots in the game, he would be at least adequate. During the Blackhawks four-game winning streak, all four of which have been started by Turco in only six days, the Hawks goalie has faced 144 shots and saved 136 of them – a ridiculous .944 save percentage. Even though the number of shots he’s facing (36 per game) is disappointing, Turco has opened eyes in Chicago and, now, around the league with his play. It was supposed to be the defensemen keeping Turco in games, not Turco bailing out the Hawks. Turco is now 4-1-1 with a 2.42 goals against average and .929 save percentage on the season. One of the keys to Turco’s strong play has been rebound control. He left a few in front of the crease in Colorado and against Detroit in his first two starts, but has been excellent kicking pucks into corners and, occasionally, playing a puck up the ice. He has also been outstanding with the glove, plucking shots out of the air in traffic and recovering well. So far it hasn’t come up roses for Niemi. In fact, Niemi is struggling in San Jose, starting the year 1-2-0 with a 3.71 goals against average and a mediocre .879 save percentage. His two losses have been to Atlanta and Carolina, games in which he has allowed four and five goals, respectively. It’s still very early, but so far Turco has been one of the best free agent additions in the entire NHL. A. Besides Duncan and Seabrook, the other guys step up so these guys minutes can go down. B. 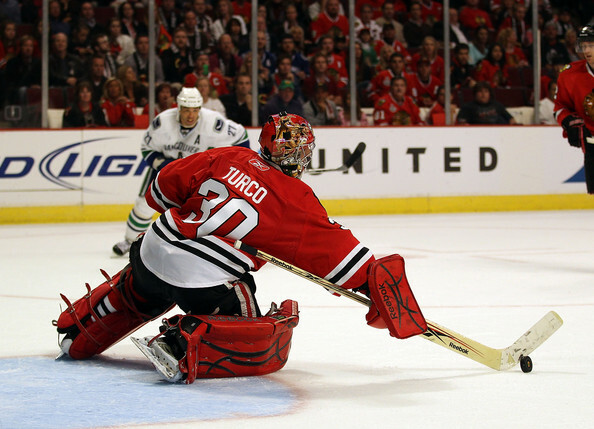 The Step Up leads Turco to face less shots making his stamina last longer for a full season. All in all though I have been impressed with the team. Hossa is out of his gourd right now, Sharpie looks amazing, and except for the fact that the Thrashers were on TV before the Hawks last night, names like Ladd, Eager, Byfuglien, are just other names on the Cup from 2010. It’s the 2011 names I look forward to seeing there more!